After the bad news of the discovery of rust in the front driver-side sill, I was due some good news. 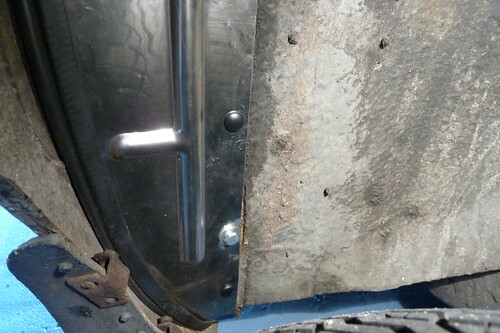 Luckily the rust had not spread past what I could see from the wheel arch. I'd decided that I would get this welded by a professional as I wanted it doing quickly so I could get driving again - the time it'd take for me to purchase the equipment and train myself in the use of it was just too long for it to be a practical solution. While it was in having the welding done, I gave them the new splash panels to fit - no point in getting a nice clean front sill area just to have it fill with grit on the way home! I had originally intended on leaving the passenger side splash panel alone as it seemed pretty solid. However I noticed that the top flange which sits on top of the trumpet section was quite badly rusted, so I decided that it would be best to get that fixed at the same time. Removing that splash panel gave all three possible outcomes of bolt removal - the bottom one came out with no problem; the middle one sheared off and the top one had to be drilled out (I managed to burn out one of my drill motors in the process!). The good news behind the panel was no rust at all on the sill. I decided to plump for the stainless steel splash panels, which although more expensive than the standard ones should last a while longer.